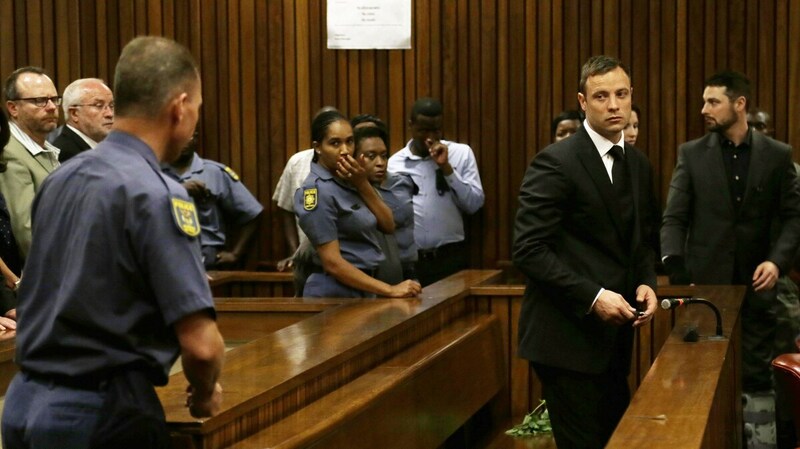 Oscar Pistorius Gets 5 Years In Prison For Killing Girlfriend : The Two-Way The Olympian was convicted of culpable homicide last month — rather than a more serious charge of premeditated murder — for the 2013 fatal shooting of Reeva Steenkamp in his home. South African track star Oscar Pistorius is sentenced to five years in prison Tuesday for the fatal shooting of his girlfriend. South African Paralympic and Olympic track star Oscar Pistorius has been sentenced to five years in prison for the fatal shooting of his girlfriend, Reeva Steenkamp. Pistorius, 27, received a verdict of culpable homicide from a judge in South Africa in September — a conviction that could have put him in prison for 15 years. As we reported at the time, Pistorius was found not guilty of the more serious charge of premeditated murder: "[Judge Thokozile Masipa] said there wasn't sufficient evidence to support the notion that Pistorius, 27, knew that Reeva Steenkamp was behind a locked toilet door in his home when he fired several shots on the morning of Valentine's Day 2013." Steenkamp's parents told the BBC they were happy with the sentence. Prosecutors had called for a minimum of 10 years, while the defense team called for community service and house arrest. "He appealed to the media to 'accept the ruling of court and let us move forward in this process and give us some degree of dignity and privacy.' "
The New York Times reports that "the athlete's defense team said the law under which he was punished calls for him to serve only one-sixth of the prison term — 10 months — before he can be placed on house arrest. He was also given a suspended three-year term on separate firearms charges." Pistorius, known as "the blade" for his use in competition of specialized artificial lower limbs, won two gold medals at the 2012 Summer Paralympics. In the same year, he became the first double leg amputee to participate in an Olympic event, entering the men's 400-meter and 4x400-meter relay races.